Exact connections will vary depending on the components in your system. In general, the connections should look like the below diagram. 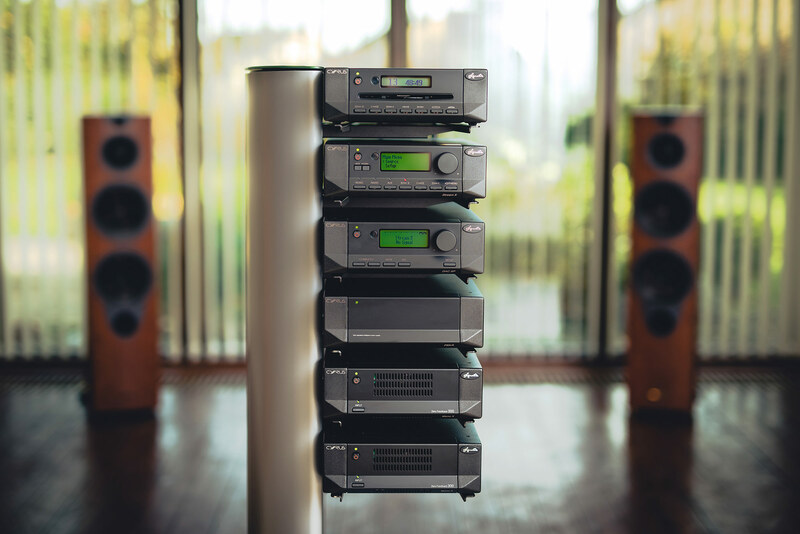 Bear in mind that some products may contain more than one component (some CD players may have a DAC onboard; an integrated amplifier contains both preamplifier and power amplifier etc). Cyrus streamers do not feature analogue inputs. To connect an analogue source such as a phono stage, you will need an ADC (analogue to digital converter). This can have an impact on the resulting sound quality though so connecting your analogue source to the amplifier (if you have a separate one) may be a better solution. Many Cyrus products feature ‘AV Direct’ allowing you to integrate your amp into your AV setup and drive your front speakers, without the need for swapping cables. If you set an input name as ‘AV Direct’ on your product, that input will become locked at a high volume. Connecting your AV processor’s front pre-outputs to that input will allow you to use the speakers connected to your Cyrus amp as part of your AV system. MC-BUS is Cyrus’ unique control system, allowing Cyrus products to communicate with each other and making the system as a whole much easier to control. The hub of the MC-BUS system is the preamplifier. This is the ‘master’ and is able to send commands to other Cyrus products (these are called ‘slaves’) connected to it via the MC-BUS system. For instance, if the preamplifier is switched to the input marked ‘CD’, it will search for connected CD players and send a signal to switch them on. If the standby button is pushed, it will send a standby command to everything connected to it via MC-BUS. This allows the system to be switched on and off with a single button push, and different sources to be automatically switched on when the corresponding input is selected on the preamp. The MC- BUS system can be enabled by connecting up the appropriate sockets on the back of your Cyrus products, as detailed in the user manuals. If you have a Stream X Signature or a Stream Xa connected with MC-BUS to a Cyrus preamp, Cadence can control the volume of your preamp, allowing you to alter the loudness of your system without using the separate remote control for the preamp. To do this, you must ensure that the input used on the preamp is assigned the input name ‘Stream’ or ‘Stream X’ and that the streamer is set to source mode. Plus and minus volume keys will then appear in the app. PDF user manuals for your products can be found here. You will need Adobe Acrobat Reader to view these files, which can be downloaded for free from www.adobe.com. Full details on how to do this can be found here. All other models that have a PSX-R socket require no modifications to be made. If you are not absolutely confident in doing this yourself, we would recommend asking your local retailer/distributor to help. Subwoofers can be connected to most Cyrus products either from the speaker outputs, or from the pre-outputs. Some sub manufacturers will give a preference for the type of connection, so this is worth double checking with them to ensure best performance.